This is my "Leaf Impressions" Frame Gallery. Choose your cut-out frame shape and wording. Customize however you wish. All frames are finished with glass and a photo pocket on the rear. A premium, upscale, heirloom-quality keepsake. Every design is engraved on the rear with full name, birthdate, current age and the month/year the impression was taken. Click on pictures below for pricing and additional information. 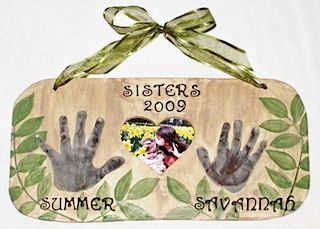 Sibling Hand Impression Frames can be made with either "Sisters", "Brothers" or whatever wording you desire. 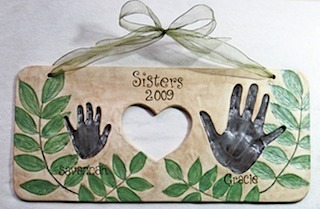 These two print hand impression Frames are created with matte, Earth-tone glazes and have actual impressions of leaves pressed around the hands. 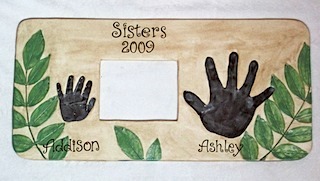 Choose from hand painted names or stamped names in either curly or block lettering. Personally, I like the hand painted names best. The frame can be cut in any shape you desire. All frames are now finished with glass and a photo pocket on the back. 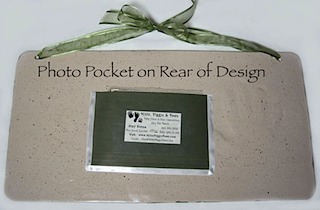 Includes ribbon for hanging, current age and birthdate engraved on back. I can also make your frame without holes for hanging in case you want to display it on a stand as in "Addison and Ashley" above.